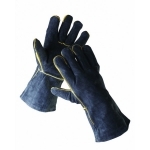 Leather work gloves provide hands protection from mechanical injures and good breathability. Leather gloves are often used for general construction and other similar works. 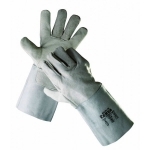 Welding gloves protect from high temperatures and molten metal. 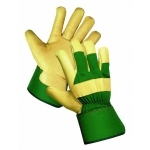 Protective gloves presented in this section can be divided into two groups: leather palm style gloves where pieces of leather are supported by a strong cotton lining and full leather gloves. 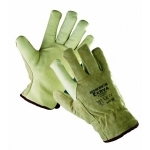 Depending on the materials used gloves characteristics and their fields of application may differ substantially. Thin well curried goat or pig skin leather will produce soft contact and very good hands dexterity. Gloves made of full grain (furniture type) leather will be handier for works with bigger ruff objects. 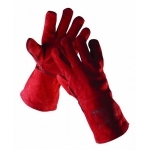 Heat resistant suede allows for production of welders gloves to work near open fire.